Here are some various tips and tricks that you may or may not want to include in your Windows 10 reference image / deployment process that I have implemented recently. Download your language pack cabinet file (lp.cab) and create a new package in Configuration Manager. I’m using the age old process of loading the default user registry hive and modifying the registry to affect a change against the default user profile. This is mainly because I’m not using copyprofile with my Windows 10 reference image. 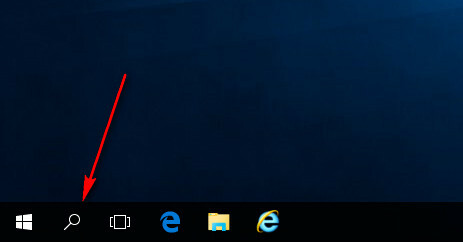 To add the Computer, Network and User Files icons and remove the One Drive setup from being launched when a user logs in for the first time we can create a reg file and merge that during a Task Sequence. Create your reg file with the following contents, you can modify as desired (be careful with the inverted commas as my blog website tends to mess with them, so open in notepad and remove and retype). 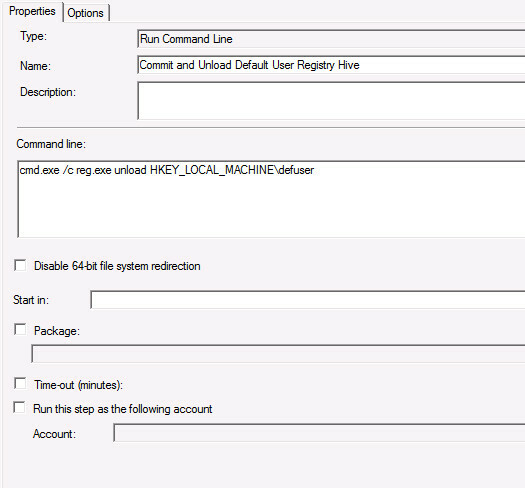 Create a new package in Configuration Manager with the registry file added as a source. No program is required. 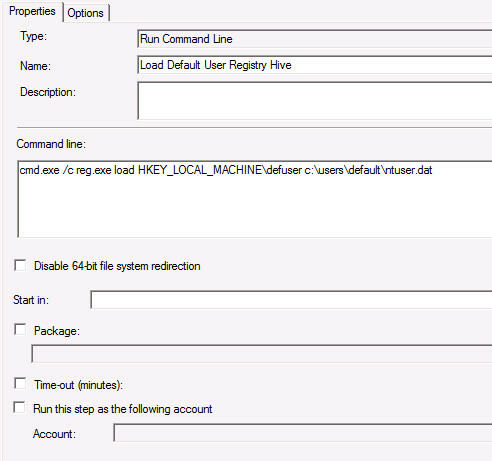 Add the following steps to your Task Sequence to load the default user registry hive, run the reg file and unmount it. Reference your new package in the 3rd step. 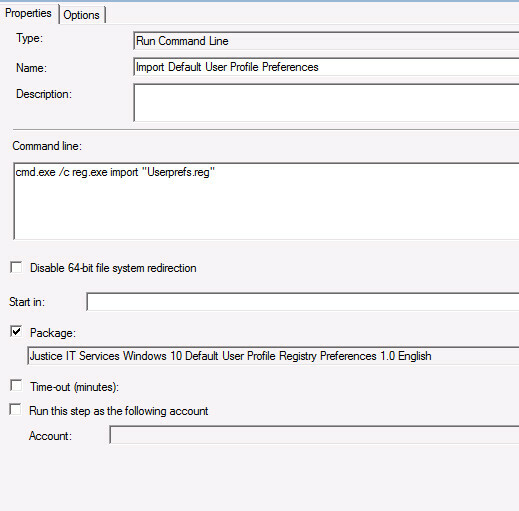 I have been trying to use the default user registry trick with MDT 2013 U1 and Windows 10 Pro x64 1511. I also gave up on copyprofie because of the start menu. Here is my situation. I have about 25 or 30 HKCU registry settings I have been trying to apply to the default user. I’m sure I have followed the step correctly. I have even ran it manually in the Admin profile. I have verified each step as working. But the new profile seems to only gets some of these settings. Below are a few examples. Can’t get wallpaper to update. Sorry Alan for the extreme late reply – for some reason your comment didn’t trigger an alert. Looking at what your trying to do – most of those settings can be achieved using GPO’s – hopefully you got it sorted though. The Features on Demand has en-AU for speech and TTS. 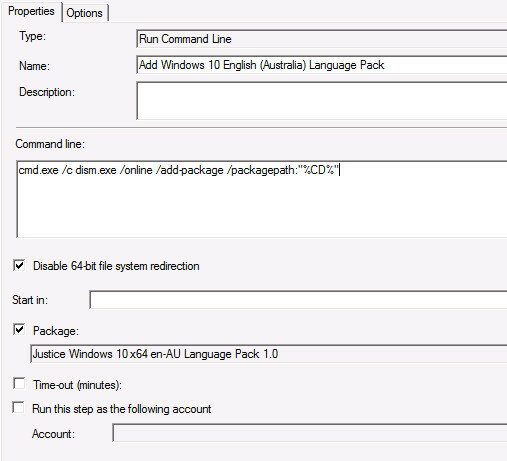 If you set your unattend.xml file locale settings to en-AU and then deploy the en-GB Language Pack then the English (Australia) Language Pack will be selected. In addition to this I install all of the en-GB feature on demand cab files and the AU speech and TTS files with a dism command in my TS. Happy to do a more in depth blog on this for you? Awesome, thanks Damon I will give that a go! If you get time for a post covering it I would love to be sure the way I integrate it in my TS is sensible. You made a reference to a .reg file that included entries to “remove the One Drive setup from being launched when a user logs in for the first time”. I would be VERY interested how you did this! Yes originally I was using a registry file to remove the One Drive setup that would launch as part of the process when a new user logs in for the first time with Windows 10 1507. However since Windows 10 1607 I’ve been using GPO to disable One Drive which prevents it from running. Take a look at https://support.office.com/en-US/article/Turn-off-or-uninstall-OneDrive-f32a17ce-3336-40fe-9c38-6efb09f944b0 for the GPO.